Can the Switch keep up? When it comes to Samurai Warriors 4 DX, this is the true test. Just how well does the Switch hold up in both docked and handheld modes? Let's check a framerate comparison between the two. 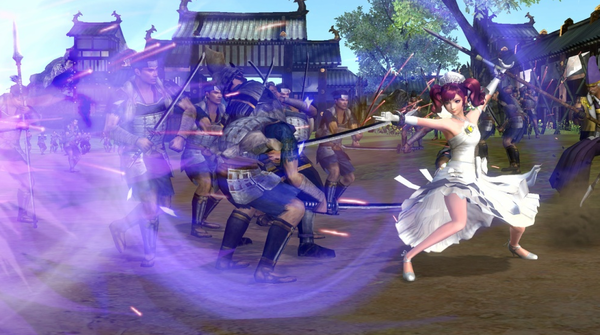 A game like Samurai Warriors 4 DX is jam-packed full of enemies. When the Switch is docked, it gets a little extra 'oomph' for on-screen action. How does the Switch handle this game in handheld mode? Check out the footage above to see for yourself. Sengoku Musou 4 DX is centered on the Sengoku period of Japan, a period of much military conflict and political warfare where Japan was divided between regions ruled by daimyōs that lasted from the middle of the 16th century to the early 17th century. 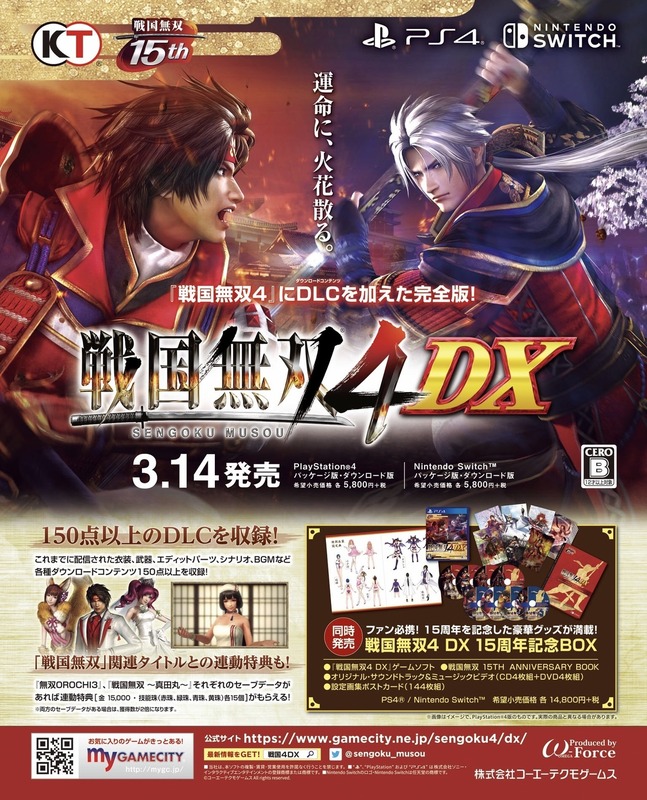 Samurai Warriors 4 DX includes over 150 pieces of previously released DLC. This includes costumes, weapons, customization parts, scenarios, background music, and more. 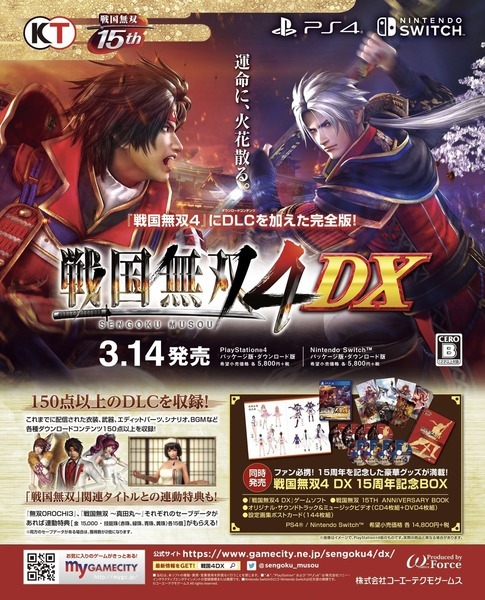 This week's issue includes a second print ad for the upcoming Samurai Warriors 4 DX. This advert is mostly the same as the first, but includes mention of DLC, as well as a look at the 15th Anniversary Box. 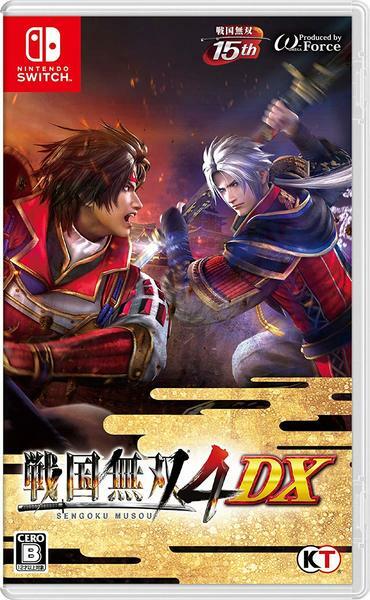 Samurai Warriors 4 DX is now available to preload on the Switch eShop in Japan. The title costs 6,264 Yen and requires 9.2GB of free space. This game does not have an English option, and no plans for localization have been announced. Here's yet another print ad from this week's Famitsu. This time we're checking out the advert for Samurai Warriors 4 DX, which comes out March 14th, 2018. Starting the advertising early on this one! Samurai Warriors 4 DX offers the full game and all over 150 pieces of downloadable content. The selection includes costumes, weapons, scenarios and a whole lot more. 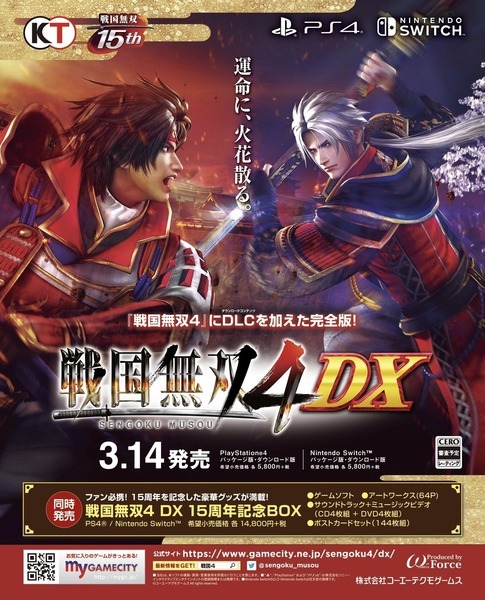 Koei Tecmo has announced special content for Samurai Warriors 4 DX. Those who have save data for either Samurai Warriors: Spirit of Sanada or Warriors Orochi 4 will get access to special items and bonuses in Samurai Warriors 4 DX. The details on that content is yet to be revealed. Along with that news, Koei Tecmo also revealed more pictures of the upcoming 15th Anniversary Box, which you can check out in the gallery above. This special box includes a 64-page art book, a four-disc original soundtrack, a set of four-DVD set of music videos and scenes, and a set of 144 postcards from the previous Treasure Box limited editions of the series. The 15th Anniversary Box is priced at 14,800 yen.